Every once in a while I look through my past writing and dust off something from the vault. I originally wrote this in April, 2009, about a week after I delivered Henry and Miranda. I’m flashing back now in honor of their birthday… today… they are two years old! When I gave birth to Ethan, I had been in labor for almost twenty-four hours, and when it came down to it I pushed for only about twenty minutes. 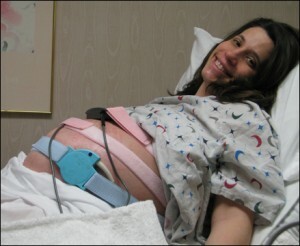 It was a great experience – well, great once I had the epidural (I had been experiencing pretty significant back labor at the beginning with no break on the back pain between contractions). I remember telling Jack that I actually enjoyed pushing (again, especially because I couldn’t feel the pain and it didn’t last long!). This delivery experience was quite different. I cannot for the life of me see why some women prefer… in fact, REQUEST to have c-sections. More convenient as far as scheduling? Heck yes! Less traumatic or tiring or stressful? Not for me. Apparently my c-section did not go quite as â€˜routinely’ as was hoped. My pre-op experience was lovely. Diane, the night Labor&Delivery nurse who took all my vitals and monitored the babies was a wonderfully calming presence. She answered Jack’s and my questions and found a spot for my mom to rest (it was 5:15 in the morning when we all arrived). Then Gloria took over, and let me tell you, she’s a woman who knows what’s what. At first she made me very nervous because she seemed quite… frenetic. Once I realized she really had her act together and was doing all her organizing out loud, I became a lot more comfortable. From the pre-op room they had me walk into the operating room, which surprised Jack. It made sense, though. I was still ambulatory, so why not? The minute I got in there I started shaking. I don’t know if I was cold, or if I was nervous. I think it must have been a combination of both. The shaking continued as I sat up on the side of the table and prepared to have my spinal. I remembered this from Ethan’s delivery — having to sit on the edge and lean over as far as I could, which, in this case, didn’t seem like very far. They kept asking me to curl further and I couldn’t. I started crying — definitely because I was nervous and this was actually HAPPENING. Spinal was administered and I was laid down on the table. WHOA. Talk about uncomfortable. The blood rushed to my head and though it wasn’t in pain it felt like it was going to explode. It took a few minutes before it felt better. Jack was on my left side — to which I had been tilted (so my big ol’ belly wouldn’t press down on a major artery and cause me to pass out). He held my hand and talked calmly to me while I was prepped for surgery. Then — I think — is when I got super nauseated. I say I think because there were several major things that happened in the course of the surgery and the order of them is a little fuzzy. Jack has tried to help me piece them together from his standpoint, but of course he was also focused on the things I could not see. The nausea was so overwhelming — I assume a reaction to the anesthesia. Thank goodness I had not eaten since my bowl of ice cream at 9pm the night before or things would have been ugly. I think I moaned a lot. And then it was gone. “I smell something burning,” I said to Jack at one point. “It’s fine,” he replied, in that tone of his that meant there was much more going on. “Oh my god did they start already?” I asked incredulously. I thought they were still prepping. Of course I started crying again — my babies were about to be born! And then we heard a loud, ticked off cry of the first baby, halfway out of the womb according to Jack, fill the room. “That’s our baby girl, Abi!” Jack squeezed my hand. They held her up for Jack to see and then took her to the team assigned to her (a respiratory specialist and a pediatric nurse, I believe). Then they started on Baby B. “That feels really weird,” I said. They were fishing around for Baby B. Oh so weird a feeling. No pain, but pressure and movement just under my ribcage… made me somewhat seasick. He had moved and was pulled out side and feet first. I didn’t hear him cry right away, but when he finally did, after he was at his station for a half a minute or so, it was nice and loud. Then.. pain. LOTS of pain. At first I didn’t really know what hurt. Jack says I moaned a lot and couldn’t give an explanation as to where I hurt. The pain localized into a searing just next to my right armpit in my upper chest. I thought I was having a heart attack. I remember my OB saying to the anesthesiologist, “Are you going to give her something for this pain because I can’t operate like this!” I guess I was writhing around a bit. Then, I was calm. My eyes were closed. Jack went to the babies at their respective stations. I could hear voices. Occasionally I would open my eyes but I couldn’t see much due to the big blue curtain in front of me. I found out later that the pain I had experienced (without going into too much of the gory details) was due to blood pooling in my upper chest in an area that the epidural didn’t cover. Nothing could be done about it until the babies were clear and they could get under my uterus. Needless to say, I lost quite a bit of blood. (Jack saw it all when they tipped me over to pour me out, so to speak. Did you know that operating tables have big deep pockets on the sides?) According to my OB, I was pretty close to needing a transfusion. I’m glad that was avoided. One by one, I saw the babies. Then both at the same time. I was overwhelmed. I was drugged out, frankly. But I was happy. They looked healthy. They sounded healthy. After that, I don’t really remember much. Jack went off with the babies to the nursery and I stayed and was stitched up. I woke up in post op and at some point my dad showed up. Then my mom and my sister. They had seen the babies are were telling me how beautiful and perfect and SMALL they were. Recovering from the blood loss took some time. Recovering from having brought two babies home at the same time? FLASHBACK: Oh sleep, you have escaped me! Posted under Flashback, Perils of Parenthood.